Matthew Bates has thrown his hat in the ring to take the Hartlepool United job. The former defender has been acting a caretaker capacity since the sacking of Craig Harrison on February 21. 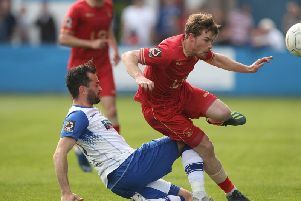 And having seen his side open up a seven-point gap to the National League relegation zone on his watch, he has won some praise from fans for his turnaround. Things have faltered somewhat lately, with two losses in the last seven days, but for the first time Bates has declared his interest, having been coy on the subject previously. When asked about taking the job, he said: “It’s something I want to do. “I would love to take this club forward next season, but I don’t know what is happening. That’s the truth, so it remains to be seen. “The takeover has been expected, it’s going to go through and it doesn’t change anything with the lads in the dressing room. Despite some recent struggles Bates has largely done well with the hand he has been dealt. He believes that due to the threadbare nature of his squad and given that a number of fixtures schedule fell in such a short period of time over the Easter weekend has taken its toll. “We take it week by week and we go to Sutton with confidence from our last away trip, a good win at Maidstone,” said Bates.